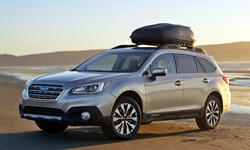 Any feedback on the durability and reliability of the new outback models? Had a '14 Outback with 50,000 miles, reliability was perfect. Traded it in on a '16 about two weeks ago, already recalled for potential steering column failure (failure to control steering). I must say that Subaru did things right, they towed the car to the dealership & provided a rental car for me for the week it took them to acquire parts and complete the recall work. We have owned both a 2011 and a 2012 Outback 3.6R. Both have been excellent in reliability - no repairs other than the USB plug getting pushed in to the console. Subaru has the reputation for needing more engine oil than average, which is true. Own a 2013 Subaru Legacy 3.6R Limited. The car is generally pretty good. We were warned that the GPS was outdated and hard to use and it is. So no complaint about that, just an obsrevation. The interior of the Subaru top of the lline model is subpar compared to the Hondas, Acuras, GM cars, and Toytoas I have owned. I have to polish the interior about once a year or more to remove scuff marks on the back of seats, on the door, anywhere there is plastic and not leather. It just seems to scuff more easily. Major repairs there are none yet. I say "yet" because we are having an oil consumptoin problem wihch afflicts about 10% of the cars they make according to Consumer Reports. We are only near 42,000 and this issue is happenig to us. To say we are disappointed is an understatement. We carry a quart of oil now so we don't get stranded but it has not happened recently. It tends to happen with a lot of highway driving so we will see what happens on our next long trip. Well I don't own one, but I've done a lot of research. the 2013 and newer years have supposedly resolved the oil consumption (piston ring failure) and head gasket failure issues. i hope this is true because in ~5 years I'd like to buy one as a used model! Both of those issues are serious and expensive, and unless the repairs are done by an above-average shop, they might not permenabtly resolve the issue. Our 2012 Forester with cracked windshield, 2nd Subaru windshield to have a crack, and the oil consumption pronlems I would not recommend it outside of warranty. Unfortunately, the newer ones have not eliminated the issue. While the head gasket problem is mosly gone, the engine oil consumption remains. My neighbors own a 2016 Outback and burns oil after 25,000 miles. My parents have a 2015 that does not burn oil with 40,000 miles. So it is still hit and miss with the Subaru H engine design. My mechanic tells me about 10-15% burn oil that he does work on. He said the Porsches he works on with the same H engine design also burn oil. He suggested it is a problem with all the cars that place the cylinders on the side.